A few weeks ago I was contacted by Virgin Experience Days to see if I wanted to review an experience days for the blog. There were a couple of different options but I knew straight away that I fancied trying a spa day. I’ve been so busy lately that the idea of taking a few hours out to relax and unwind just seemed heavenly. The service from Virgin Experience Days themselves was really good. 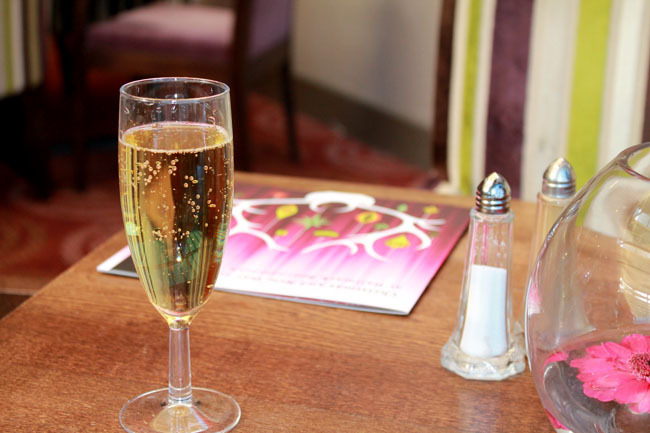 I chose the Pamper Day and Champagne Lunch For Two which normally retails at £49 (the website says it’s reduced from £98) and the vouchers came quickly in a nice cardboard sleeve that could be given as a gift. 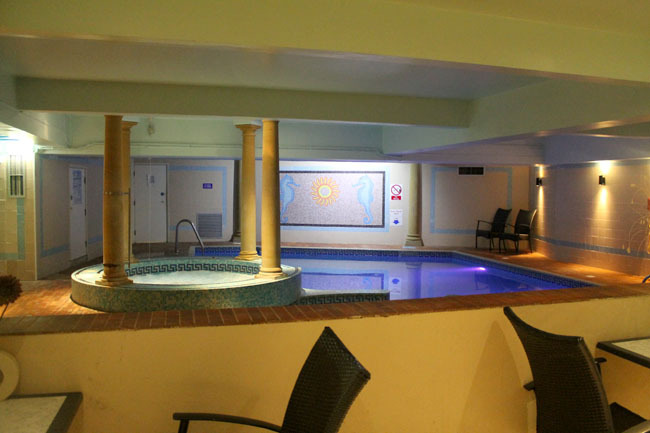 We had a choice of hotels and spas and we chose one in Bournemouth, the “>Hallmark Hotel, as it was the closest to us. Again, it was booked easily with a quick phonecall. I didn’t know what to expect from the day itself because I’ve never been to a spa day before, so I can’t compare the day to others I’ve been to. My expectation was to feel relaxed, and, to an extent, pampered. I guess I imagined fluffy robes, slippers, dim lights and calming music but maybe that’s just what spas are like in the movies! If you’ve been to a spa day please do share your experiences in the comments as I’d be really interested to hear what others are like. We arrived just before 11 and booked our lunch for 1pm. We were shown the facilities, which included an aromatherapy cave, steam room, sauna, pool, relaxation lounge and jacuzzi. There was also another indoor pool upstairs but that had separate changing rooms and I didn’t fancy getting undressed twice (or walking through reception in my bikini!) so we just stayed downstairs. I was surprised by how small the spa area was; you could only really splash around or sit in the pool, you couldn’t do lengths or anything and I’d say you’d only comfortably fit 8-10 people in there. We were given a couple of towels and then we tried the amenities. The steam room was quite nice but there was a mosaic theme and quite a few of the tiles had come loose. Actually that was a bit of a running theme throughout the spa if I’m honest; there were lots of loose/missing tiles and it all looked a little tired and in need of some TLC. The sauna was also nice but again, when more than 3-4 people were in there it was a bit cramped. I didn’t really understand the point of the aromatherapy cave, it didn’t smell particularly nice and there was a big hole in the middle of the floor where so many floor tiles were missing. The final room we went in was the relaxation room, which was just some sun loungers, magazines and a water feature. There were some girls in there reading magazines, I wish I’d thought to bring one as that probably would have been quite a nice place to relax. Amusingly for us, after we’d done all of this we looked at Tom’s watch and it was only half 11! We had no idea what we were going to do for the next hour and a half until lunch. In the end we just splashed around in the pool and sat in the steam room until it was time for lunch. I heard some women in the changing room talking about treatments but I have no idea what they do there; it wasn’t mentioned to us on the phone or when we arrived and I didn’t see any treatment rooms. The changing rooms were tiny with two tiny cubicles so I had to queue to get changed. We were shown upstairs to the bar and were served a glass of champagne which was really nice. The restaurant for lunch was just actually the bar area for the hotel and was quite busy with guests. 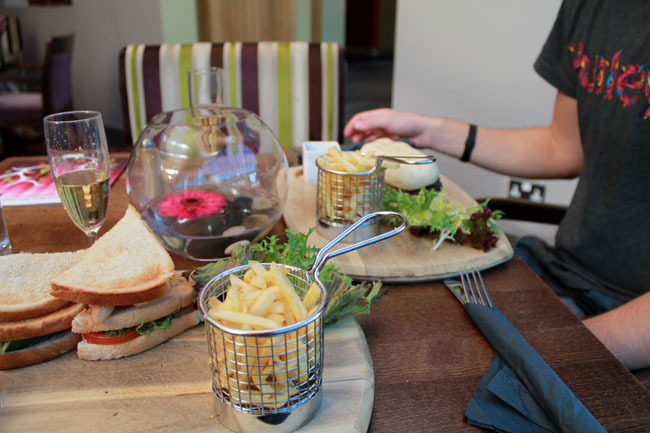 We were allowed to choose anything from the lunch menu which ranged from £5 sandwiches to £10 main meals. I went for a club sandwich and Tom had a steak sandwich. Because I’d been slightly disappointed with the spa itself I really wanted the lunch to be amazing but it just wasn’t. Tom asked for his steak to be medium-rare and it was more like well done and my club sandwich was just a chicken breast, a rasher of super crispy bacon and then some lettuce and tomato; no sauce or flavour or anything? I left half of mine as it was really tough and tasteless. I was hesitant about posting this review as Virgin Experience Days were so kind in asking me to review the experience and I’m really appreciative we were given this opportunity, and it’s completely not their fault that the hotel was disappointing. But I feel as though I have to review it as if I’d paid the £49 in order to be able to recommend it or not, and I have to say that if I had I might have been a little disappointed (I certainly don’t think there’s any way they could charge the £98 it’s reduced from). What I would say is that my parents have used Virgin Experience Days in the past and have always had good experiences – they’re quite a regular Christmas present in our family! I’d have no hesitation in recommending them though I don’t know if I would recommend going to the Hallmark Hotel (Bournemouth). There was a sign outside saying that monthly membership (which includes spa access) is £25 so you could use the amenities for a month for what you pay each, which somehow makes it feel a bit less ‘indulgent’! I think if I stayed there as a guest it would be amenities that I’d enjoy using if I was there, but in my opinion I don’t think it’s special enough to offer as an ‘experience day’ for non guests. The other hotels offered in that particular deal look absolutely amazing (there is a castle on there, and some of them sound like they’re in amazing locations) so my feeling is that the deal itself offered by Virgin is a good one, but I’d give this particular hotel a swerve. I was thinking about booking a spa break for both of us in the New Year but now I’m not so sure as maybe I’ve ‘overegged the pudding’ in my head in terms of what I think a spa day is like and I don’t want to be disappointed again! Do share with me your experiences as I’d love to hear if you’ve been on a spa day or another experience day similar.